Lee for Sale at Mount Vernon? Robert Edward Lee, a West Point graduate, was the first to graduate with no demerits during his four years at the Academy. After his graduation he married Mary Custis, the daughter of George Washington Parke Custis. As a General of the Confederate Army his achievements won him a high place amongst the great generals of history. Even after his surrender to General Grant, he was an example of how southern gentlemen should behave by taking action to rebuild the south and urging on his own people to accept the new conditions of the nation. 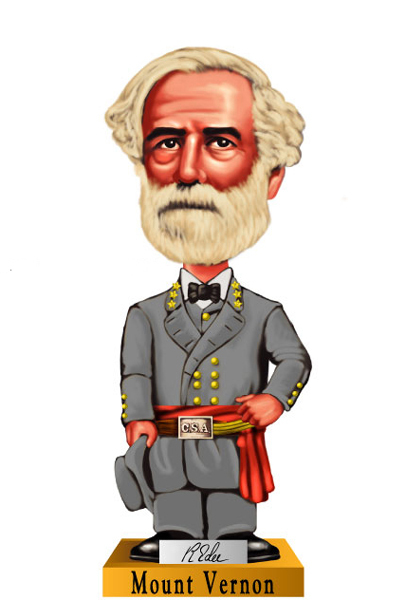 This boxed Robert E. Lee Bobblehead is made of resin and is approximately 7.6” tall. That’s not very helpful since the supposed connection between Washington and Lee is thought to have been much more substantial. I thought it might be an opportune moment to recycle an old post on just this question. The following was posted last May as I was finishing up Elizabeth Brown Pryor’s Reading the Man: A Portrait of Robert E. Lee Through His Private Letters (Viking 2007). This book is a must read. One of the early chapters in Pryor’s book deals with the supposed influence of Washington’s memory on Lee’s life. Most of us take it for granted that Lee idolized the first president and even some historians have assumed a “mystical bond between the two men.” Pryor argues that most of these stories surfaced following the Civil War as part of a broader push on the part of white Southerners to justify secession and connect the Confederate experience to the “untarnished greatness” of Washington. Of course there is a great deal of history to work with in forging this connection given Lee’s marriage and his early years which were spent in large part at Arlington and in the shadow of Washington’s memory. Pryor does not ignore any of this evidence, in fact she agrees that the memory of Washington did play a role in shaping Lee’s career and personal behavior. More recently, Pryor references Richard McClaslin’s book-length study, Lee in the Shadow of Washington. Most of the following commentary can be found in Pryor’s endnotes. McClaslin’s evidence includes letters from Lee’s father on paternal guidance, but they do not mention Washington and there is no evidence that Lee ever read them. In addition, McClaslin cites Henry Lee’s memoirs, but again there is no evidence that he actually read it until after the Civil War or if he did that it had any influence. (fn60, p. 497) Additional footnotes further challenge claims made by McClaslin in reference to the Mexican War and Lee’s decision to continue to improve Arlington for the purposes of displaying Washington relics. In the case of the latter, Lee did indeed add a parlor room in 1855, but the room was filled with Lee family portraits and other items. I think it is important to remind the reader once again that Pryor is not arguing that memory of Washington did not influence Lee, but that the extent of that influence suggested by historians and other commentators is not borne out in the primary source material that is currently available. Very interesting post. However I tend to think Mt. Vernon just figures history-related = possibility to make money. Relatedly, however, to the thesis that tying Lee to Washington enhances Lee’s image, I am reading a book now about Lincoln’s years as a lawyer (“An Honest Calling” by Mark E. Steiner) in which the author argues that the memory of Lincoln as a lawyer was deliberately downplayed and mischaracterized by his numerous hagiographers because of the negative cultural image of lawyers in American society. No doubt and I am willing to bet that the Lee bobblehead outsells G.W. I read Brian Dirck’s study of Lincoln’s law career, but not Steiner. That point about the memory of Lincoln and the law is quite interesting so perhaps I will check it out. I believe this is analogous to what you were talking about earlier with the selective narratives regarding the Civil War. In any event, there’s something in this story that would make a good bobblehead. Maybe I should look into that…. In addition, his father, Light Horse Harry Lee, rode alongside Washington, leading the troops that put down the Whiskey Rebellion in 1794. Two great-uncles, Richard Henry Lee and Francis Lightfoot Lee, signed the Declaration of Independence. So the Founding Fathers’ establishment was all entwined with Lees and George Washington. It’s generally accepted (if not documented in Lee’s letters, which were never introspective, no matter what Pryor imagines) that Lee’s admiration for and family connections to Washington, together with the opportunity to work at something noble and useful (rather than just sell his name as a front man to an insurance company or another such venture, as were among his other postwar employment offers), persuaded him to accept he presidency of an isolated, unknown Latin prep school, as it was before he transformed it into a university of national stature. Some of Pryor’s “reviews” on amazon appear to have been written by bobbleheads. One of these induhviduals (as Dilbert creator Scott Adams dubbed the type) calls her a “pissant” for daring to dig under the marble facade built around Lee. As usual, more revealing of the writer than of the subject. Something about the proportions reminds me of a Precious Moments doll–an adult, hirsute, treasonous Precious Moments doll. Thanks for taking the time to comment. I agree that it is “generally accepted” but historians must work on the available evidence and, according to Pryor, some of the more extreme claims about Lee’s supposed identification with Washington are not grounded in evidence. So, what do we do about that? It’s interesting that we didn’t hear too much in the way of the standard responses to this type of biography that it represents the liberal-revisionist slant of the academic community. Pryor is not a Civil War historian (in the obvious sense) and her book is thoroughly researched regardless of whether you agree with all of her conclusions, which I certainly do not.